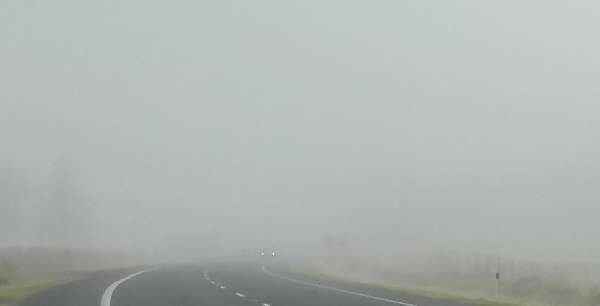 When driving in foggy weather, what should you do? When driving in foggy weather, what should you do? Fog is a cloud at ground surface level; it's a dense bank of water droplets suspended in the atmosphere that reduces visibility below 1km. Mist is similar to fog, but visibility remains above 1km. For driving purposes, it's often only described as foggy when visibility dips below 180m, whereas pilots use the 1km benchmark. Haze is even thinner than mist. You should dip your headlights, not drive with them on full beam as fog reflects the light back towards you. Also, use a rear fog light, but only until the fog clears as it can dazzle other drivers. If you have front fog lights (they are usually low-mounted lights in your bumper), use them. They have a wide, flat beam which doesn't get reflected back as easily as it's closer to the road surface. As the fog thins into mist your high beam headlights might become more useful. Fog is often a morning or evening phenomenon. As well as increasing your following distance to 4-5 seconds from the usual 2 seconds, it can help to use the air conditioning and the rear demister to keep windows clear. If water collects on your screen you can use the wipers but bear in mind that there might not be enough water to warrant using the wipers continuously. If you are driving in rural areas there may be wildlife on the road. Some wildlife, e.g. deer, prefer to roam about in reduced visibility, and they won't be able to see you, either. If it's freezing, fog can freeze on the road and cause black ice. Use the left edge of the road as a guide. Pay attention to the lights of the vehicle in front, but don't tailgate. You must be able to stop in the distance of clear road you see in front of you if the road has lanes. Pick a point on the side of the road ahead and count four seconds. This will give you ample reaction time and stopping time. As you can see in this image, the fog doesn't look to be that thick, but you have to look closely to see the two pinpricks of light that are a vehicle less than 200m away. If the vehicle didn't have its lights on, it wouldn't be visible. If you need to pull over on the side of the road, turn your hazard warning lights on. This video gives you a good idea of how driving in fog can reduce your visibility. It's interesting to note that the driver is less than two seconds behind the vehicle in front even when the fog is extremely thick at around 3 minutes in.